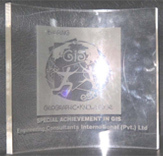 Special Achievement Award in GIS in 1999 & 2008. Election Commission Pakistan SAG award on application developed by ECIL. First International Civil Engineering Congress, IE 1998.